NO COTTAGE REQUIRED! Serene 2 ACRE river property set back from the highway w/no traffic noise but still only 20 minutes from downtown!...Fantastic views from 33 new triple pane windows & 5 sets of patios doors... 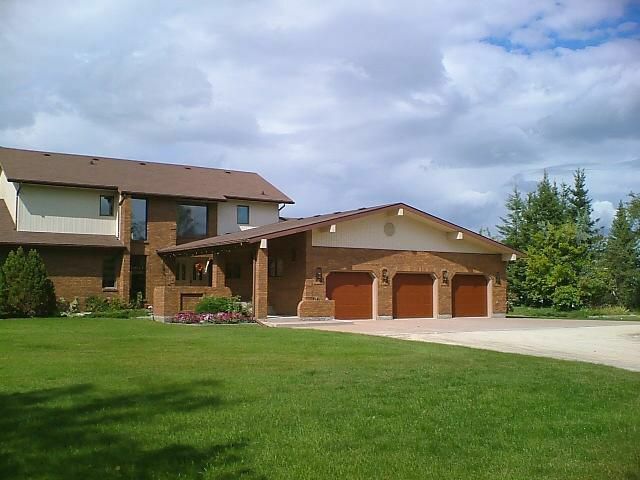 HUGE MAIN FLR MASTER BEDROOM w/gas fireplace, walk-out patio, oak floors, walk-in closet and luxurious 5p ensuite bath w/heated marble floors...Triple att. garage, rare 1/4 oak floors and casings...underground sprinkler system...UPGRADES: 2 new Lennox 70,000 BTU furnaces - (07), 1 Lennox 2-1/2 ton air conditioner (09), water softener (07), iron filter (07), pressure tank ? fibreglass (07), septic field pump (10), sump pump (11), 80 gal hot water tank ? electric (2010), basement R26 insulation (08), eaves / fascia (10), ENOURMOUS KITCHEN w/ new Brazilian granite counter tops (10), Flooring - DuraCeramic Tiles (09), Franke Orca sink (10) and 24 seperate oak cupboards. Master Ensuite: Bain Ayoura Thermo Masseur bath, Japanese Toto Neorest 550 toilet, Maax Stamina shower. Intercom w/radio & MORE! East st. Paul listing expert/specialist!